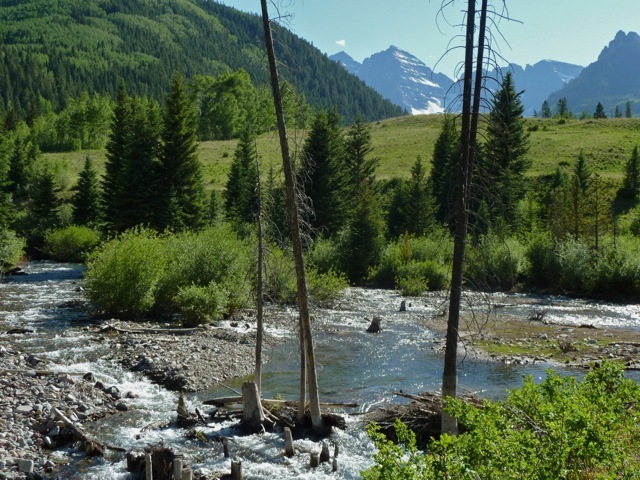 The City of Aspen continues to reach settlement terms with ten parties opposing their efforts in water court to maintain conditional water storage rights on upper Castle and Maroon creeks. Instead of building a 155--foot-tall dam at this location on Maroon Creek, the city says it will seek to transfer its conditional rights to other locations, including the city's golf course and locations in Woody Creek. The city of Aspen continues to make progress on reaching settlement agreements with 10 different parties over its water rights on Maroon and Castle creeks, and a water referee set deadlines that could lead to a resolution before the end of summer. At a status conference Tuesday, both the city and its opponents said progress is being made toward resolving the cases. “I feel optimistic we are moving toward a settlement,” said Cindy Covell, a water attorney for the city who is with Alperstein and Covell in Denver. So far, five of the 10 parties who oppose the city’s efforts in water court to maintain conditional storage rights tied to potential dams on Maroon and Castle creeks have signed settlement agreements. Still left to sign are American Rivers, Trout Unlimited, the U.S. Forest Service, Larsen Family Limited Partnership and Roaring Fork Land & Cattle Co.
Attorney Paul Noto, who represents American Rivers, Trout Unlimited and Roaring Fork Land and Cattle Co., said his clients will likely settle soon. That leaves two other parties that are further away from settling, Larsen Family LP and the U.S. Forest Service. Attorney Craig Corona of Aspen, who represents the Larsen family, told water court referee Susan Michelle Ryan on Tuesday that he and the city are “definitely” making progress toward finalizing a settlement. The U.S. Forest Service has been difficult to reach lately, according to Covell. Upper Castle Creek, about two miles below Ashcroft, where the city holds conditional water storage rights tied to the potential Castle Creek Reservoir, which would be formed by a 170-foot-tall dam. 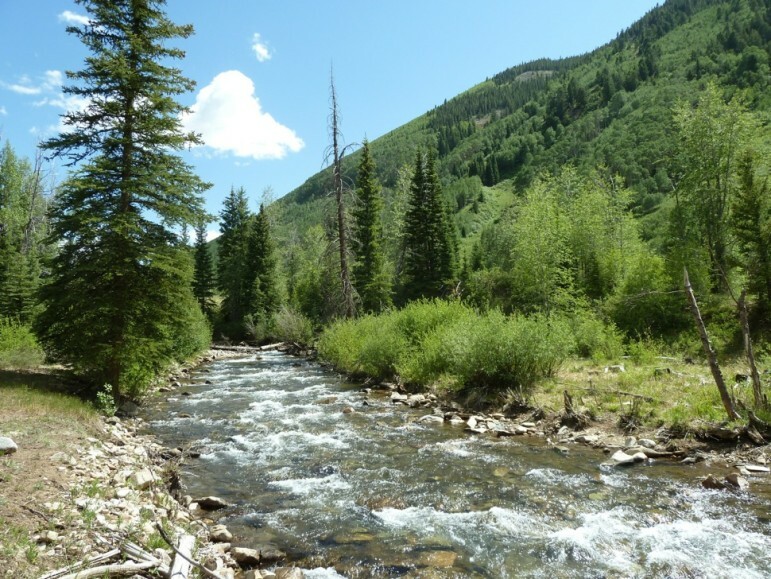 The city is moving closer to reaching settlement agreements with the ten parties opposing the city’s effort to hang on to the water rights, and the settlement includes moving the city’s rights out of the Castle and Maroon creek valleys. Ryan set a deadline of July 10 for the remaining opposing parties to respond to the city’s settlement proposal. The city must respond to those responses (if a response is necessary) by Aug. 7. The next status conference is scheduled for Aug. 21. The cases are being heard in Division 5 Water Court in Glenwood Springs. The new deadlines mean the cases will extend past the 18-month deadline of disposition, but Ryan decided to keep them on her docket since progress toward a resolution is being made. Since 1965, the city has owned conditional water rights for reservoirs on Maroon and Castle creeks. In October 2016, the city filed a diligence application to maintain the water rights, which are tied to potential dams. The potential Maroon Creek Reservoir would hold 4,567 acre-feet of water and include a 155-foot-tall dam, which would flood part of the Maroon Bells-Snowmass Wilderness. The potential Castle Creek Reservoir would hold 9,062 acre-feet behind a 170-foot-tall dam 2 miles below Ashcroft. The possibility of two new reservoirs and dams didn’t sit well with 10 parties, who filed statements of opposition to the two water rights cases in December 2016. Under the agreements, the city will seek to transfer its conditional water storage rights to other potential reservoir sites, including a gravel pit near Woody Creek, with a maximum storage capacity of 8,500 acre-feet. As part of the deal, the opposing parties have agreed not to fight the city’s efforts to move the water rights to new locations for 20 years. The five parties that have already signed the agreements include Pitkin County, Wilderness Workshop, Western Resource Advocates and two private property owners in Castle Creek Valley. Editor’s note: Aspen Journalism is covering rivers and water in collaboration with The Aspen Times and Glenwood Springs Post Independent. The Times published this story in its print edition on Thursday, June 28, 2018.